With the launch of the Alturas SUV, the XUV5OO will no longer remain the flagship product for the automaker in India. 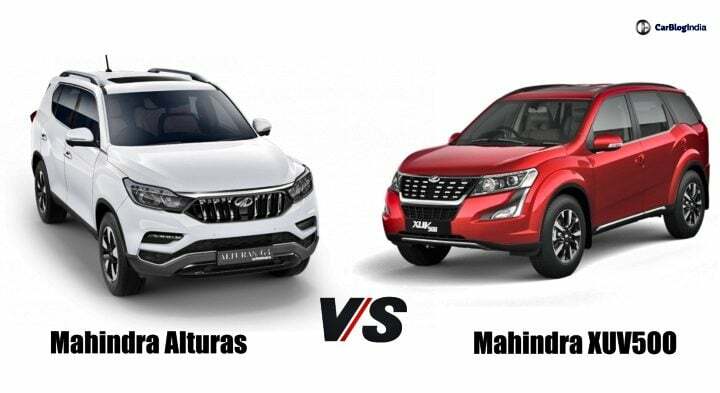 With the Alturas being placed several segments above the XUV 5OO, does it really stand as a premium alternative for the former? What are the basic points of differentiation between the two? Read along as we compare these two SUVs against each other on the basis of a number of different parameters in this detailed comparison report. Going by current speculations, we can put the prices of the Mahindra Alturas in-between the range of INR 20 lakhs to INR 25 lakhs. As mentioned before, it will sit above the XUV 500 in Mahindra’s portfolio for India. With this prices tag, this SUV is going to compete in the league of Toyota Fortuner and the Ford Endeavour. However, its main rivalry is going to be with the Isuzu MU-X. In comparison, the prices for the Mahindra XUV 500 range in-between INR 12.56 to INR 19.26 Lakhs. This SUV is available with both petrol as well as diesel derivatives. The petrol derivative comes in only a single variant. It is priced at INR 15.64 lakhs. So far, there has been no official confirmations regarding the engine specifications of the Alturas. However, numerous speculations state that this new flagship SUV is going to offer both petrol as well as diesel derivatives at the time of launch. The diesel derivative is going to get a 2.2-litre unit. This oil-burner will churn out 185 BHP of power along with 420 Nm of peak torque. On the other hand, the petrol derivative is going to get a 2.0-litre unit. This gasoline-powered engine will produce 225 BHP of power along with 220 Nm of peak torque. Both the engines are likely to come with a 6-speed manual gearbox as standard. On the other than, there will be a 7-speed automatic gearbox on offer as well. Now coming to the Mahindra XUV 500, this SUV, as mentioned before, comes with both petrol as well as diesel derivatives. The diesel engine on offer is a 2.2-litre unit which is capable of producing 154 BHP of power along with 360 NM of peak torque. The petrol derivative, on the other hand, gets a 2.2-litre unit which is capable of churning out 140 BHP along with 320 Nm of peak torque. The diesel engine is available with a choice of a 6-speed manual gearbox and a 6-speed automatic torque converter unit. The petrol derivative, on the other hand, comes only in a single variant and is paired with a 6-speed automatic unit. As the engine specifications of the Alturas or the Y400 are still unknown, it will not be wise to say a specific mileage figure for this SUV. However, we can estimate that its 2.2-litre engine is likely to give a maximum fuel-efficiency figure of 15 Km/l. However, the minimum figure expected from it stands at 11 km/l. Moving on to the XUV 500, its diesel engine promises an ARAI certified fuel-efficiency figure of 14 km/l with the manual gearbox. Interestingly, the automatic gearbox also promises to offer 14 km/l. The petrol derivative of this SUV has a mileage figure of 13.85 km/l. As you may already know, the Mahindra Alturas or the Y400 is based on the same underpinnings as that of the 2018 Ssangyong Rexton. Hence, going by that we can expect the length of this SUV to measure 4,850 mm, width as 1,960 mm and height as 1,800 mm. This utility vehicle will sport a wheelbase of around 2,865 mm. Moving on the Mahindra XUV 500, this premium utility vehicle measures 4,585 mm in length, 1,890 mm in width and 1,785 mm in height. This SUV sports a wheelbase of 2,700 mm. The ground clearance stands at 200 mm. The Mahindra XUV 500 is no slouch when it comes to offering a decent equipment list. Mind you, this vehicle has so far kept the baton high for Mahindra as the automaker’s flagship product. And hence, the homegrown automaker has loaded it with creature comforts right up to the brim. Here is a brief sum-up of all the features which are available on this SUV.